Teat cups safely parked in the arm. More effective cleaning and stimulating. 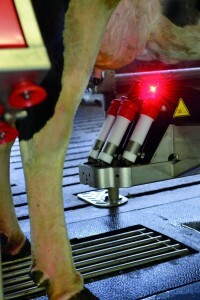 Tailor-made milking through dynamic pulsation. Relaxed milking due to fewer arm movements. Never a cup on the floor. Energy savings through fewer movements.